Box Tops are due tomorrow! Tomorrow is the last day to turn in your box tops! The next contest ends this Friday, May 1st. Don’t forget to indicate the teacher’s name so your kid’s class gets a chance to be recognized. 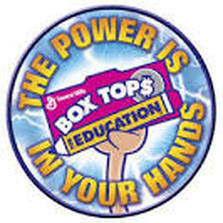 Did you know that: Pleasant Ridge received more than $1500 from Box Tops last year! I know we all love our teachers here at PR, and this is our week to show them we think they are awesome! Here’s how you can help us celebrate the stars of Pleasant Ridge: OUR teachers! Monday: Write your teacher( don’t forget specials) a fan letter or card. Tell them why you think they are stars! Tuesday: Let’s show our teachers how grateful we are and give them a flower today. Pick one or color one, the choice is yours! Wednesday: Spoil your teacher! Bring in a classroom supply. Thursday: Give your teachers a VIP lunch! Sign up here to send in sides, drinks, and deserts! Friday: Wear BLUE and GOLD for spirit day! There was a lot to discuss at the April PTA meeting. Most importantly, thank you to everyone for making last month’s Carnival and Auction a big success! We raised significantly more than was planned and that money goes directly back in to the school to benefit all of our kids. Thank you to the army of volunteers who helped with it and to the army of families who came to enjoy it. Our next meeting is on May 14 … Click here to read about everything we discussed and why you should come to the next meeting . Hope you can make it! Hope you had fun at the carnival. Can’t wait to see your smiles next year.